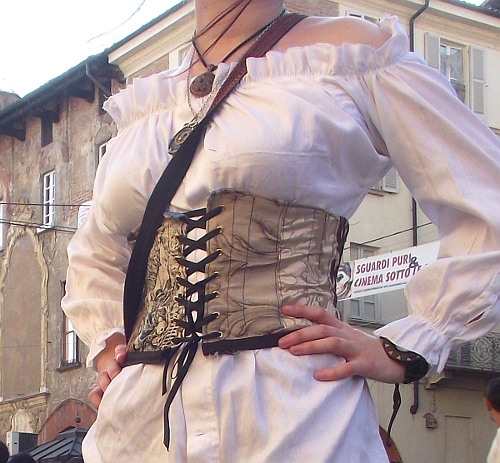 The last time I posted a tutorial it was about how to make a steampunk waist cincher, today I’m doing something way more simple, something you might use for other occasions too, more than just a cosplay! I have no idea why it is called “peasant” or “poet” or “whatever” shirt, it’s basically a puffy shirt. It puffs everywhere. I upcycled one of my dad’s old shirts, white, medium weight, really soft and with a subtle paisley fantasy to it that explains why dad was so ready to discard it! But to me it was perfect. Phase one: take the elastic band and measure it around your shoulders, it has to be in tention but it must not be too tight. Cut some cm more as seam allowance. Sew it close. Cut the shoulders and neck, and the wrists off the shirt. 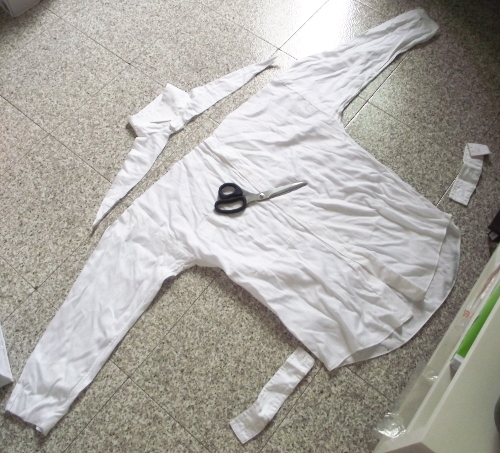 Remove any pockets, sew the gap of the wrists closed (but not the wrist itself!). 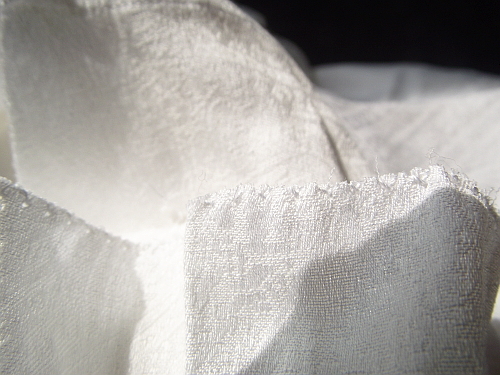 Secure the cut part with a zigzag stitch all around, in a mock hem. Put the elastic band in place and keep it there with four pins, like you where marking the cardinal points. When you sew it in place (I recommend again a zigzag stitch), pull the elastic so that it is as wide as the shirt (which, in turn, is NOT stretchy, right?!!) this way it will form a natural gathering. Do this for shoulders and wrists. Mi piace un sacco! Tanto tempo fa ne avevo una praticamente identica, miracolosamente trovata in un negozio a Londra.. è andata perduta!